It’s been a busy year for Eatzi’s, which opened its fifth store in May and its sixth in October, and Adam Romo’s day reflects that. Romo, who served as the company’s chief financial officer from 1996 to 1999, rejoined the company in May 2011 after a brief stint in California. With more than 25 years of experience in the retail and restaurant industries, Romo has spearheaded the company’s concept and growth. But despite his list of accolades—or his daily laundry list of responsibilities—Romo maintains a humble and patient demeanor. Wakes up and grabs a latte on the way to the gym, where he enjoys doing cardio on the treadmill and bike. He says starting his morning with a workout keeps him energized throughout the day. Heads home where he makes a breakfast protein smoothie (spinach, avocado, pineapple, and protein). Romo uses this time to review the previous day’s reports and emails. Hops into his black Range Rover and drives to the Eatzi’s Lovers Lane location. Romo likes to see the stores in action during different points of the day, so he rotates his daily visits. Eatzi’s Plano location is one of five across Dallas-Fort Worth. Drives north to the Plano location, where he immediately senses that one of the chefs is nervous. 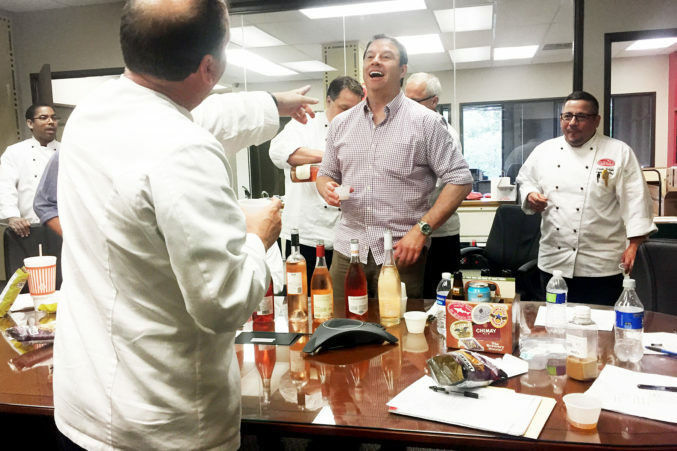 A USDA inspector has made a surprise visit—the first-ever for Eatzi’s. 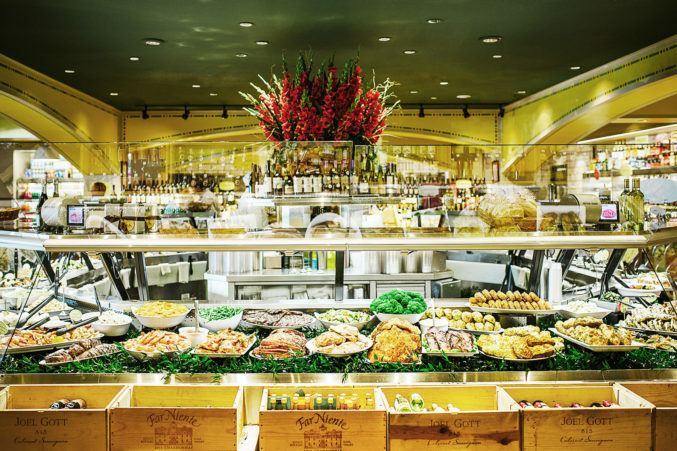 Romo maintains a calm demeanor, reassures the chef, and gets the updates on the store. Arrives at CBRE to review the new Preston/Royal site and potential new-store locations. Romo says an ideal location is near retail and residential. Taste Testing New Recipes: Adam Romo, left, samples new recipes from his five stores. Romo grabs a Hawaiian roll with brown rice and salmon. Sushi is his favorite on-the-go food item. Checks in with the store manager and tries a new dish. Chefs are at liberty to experiment with new recipes. Meets with the architect and contractor at Selzer Associates for updates on the Preston/Royal location. Discusses the store’s façade and patio area. 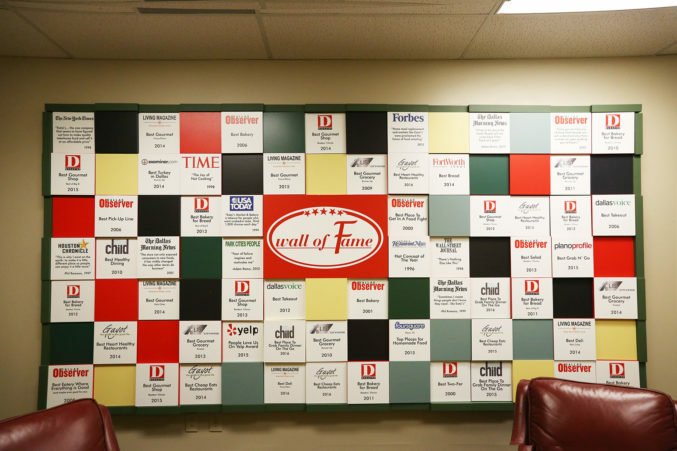 Eatzi’s Wall of Fame: The eatery’s numerous accolades are displayed at the company’s headquarters. Makes it to Eatzi’s headquarters, which displays a wall of fame highlighting Eatzi’s accolades throughout the years. Checks in with Eatzi’s CFO Brian Snow for updates. Holds one-on-one meetings with leadership, marketing, and human resources. Dinner with wife, Tammy Romo, CFO of Southwest Airlines. After, he tackles emails and reviews the day’s sales reports.